This recording is dedicated to Oksana and Daria ERNESTO NAZARETH (1863-1934), one of Brazil’s first and most influential composers, was a patriarch of Brazilian music. His output, a collection of 229 works was a milestone in the history of Brazilian instrumental music and over time has continued to gain ever more admirers. Through his instrument, the piano, Nazareth was able to communicate the strong syncopated rhythms that he heard in the choro bands playing in the streets of Rio de Janeiro. These choro groups, consisting typically of flute, cavaquinho and acoustic guitars, were a major source of Nazareth’s inspiration, but it is also apparent from his music that he loved Chopin as well. It was with deep love and admiration for Nazareth’s music that I attempted to adapt some of his wonderful pieces for the guitar. Since it was the sound of the guitar that often inspired Nazareth’s beautiful work, it seems only natural to return some of his pieces to their original source. I have tried in these arrangements to remain as close as possible to the original piano versions, respecting their rhythms and harmony. The result, hopefully, is a set of pieces that could have actually been written for the guitar. - Sergio Assad “The popular and influential Brazilian composer Ernesto Nazareth (1863–1934) wrote on piano, but many of his pieces have been successfully adapted to guitar in modern times—here, we’re treated to 16 pieces lovingly arranged by contemporary Brazilian guitarist/composer Sérgio Assad (who graces the cover of the Summer 2017 issue of Classical Guitar) and gracefully played by Marc Teicholz, who currently teaches at both the San Francisco Conservatory of Music and Cal State East Bay. In his notes for the album, Assad notes that Nazareth was influenced both by rhythmic street choro bands and other native Brazilian performers, as well as classical musicians such as Chopin. You can hear strains of many different styles in this lively selection of tunes, from choros to tangos to waltzes, bits of ragtime, ballads; many pieces feature of mix of tempos (such as the exquisite title track). Teicholz’s sure and tremendously appealing interpretations of Assad’s arrangements truly show off Nazareth’s gifts as a composer to the fullest. Highly recommended!” Besides this exceptional recording, Les Productions d’Oz/Doberman-Yppan is also offering a 68-page book containing Assad’s arrangements for all 16 pieces, aimed at advanced players. For many of us non-Brazilians, our intro­duction to the legacy of Ernesto Nazareth (1863--1934) was a legendary 1989 clip of the Assad brothers performing Escorre­gando on a single guitar. 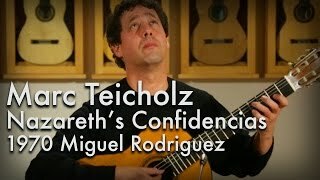 A more restrained performance of the same piece appears on this stylish and amiable release from Marc Teicholz - a link between the two versions being established by the revelation that Teicholz’ recording is produced by none other than Sérgio Assad, who is also cred­ited with all 16 arrangements (from piano originals) and provides the program notes. This is a charming set of retro minia­tures in which only Turbilhao de Beijos exceeds the five-minute barrier. Given that Villa-Lobos was Nazareth’s junior by just over two decades, it’s perhaps best to see Nazareth as a key figure of the pre-Villa­-Lobos generation. Although not many would mistake the Villa-Lobos Etudes for the work of Nazareth, it’s universally accepted that Villa-Lobos drew much inspiration from the chôro groups to wich Assad refers in his notes on Nazareth. It’s certainly possible to detect parallels with Nazareth’s developed yet popular-leaning language of Suite Popu­laire Brésilienne. All is secure on the playing front, with Teicholz’ mix of the rhythmic and the lyrical in keeping with the upbeat yet unassertive character of the program. Guitars by San­tos Hernândez (1930) and Robert Bouchet (1961), further enhance this classy presen­tation of a significant chapter in Brazilian music.